The History of the Philosophy of Mind is a major six-volume reference collection, covering the key topics, thinkers and debates within philosophy of mind, from Antiquity to the present day. Each volume is edited by a leading scholar in the field and comprises chapters written by an international team of specially commissioned contributors. 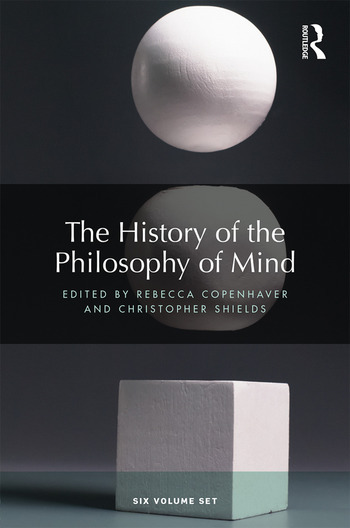 Including a general introduction by Rebecca Copenhaver and Christopher Shields, and fully cross-referenced within and across the six volumes, The History of the Philosophy of Mind is an essential resource for students and researchers in philosophy of mind, and will also be of interest to those in many related disciplines, including Classics, Religion, Literature, History of Psychology, and Cognitive Science. 15. Intellect in Alexander of Aphrodisias and John Philoponus: divine, human or both? Frans A.J. de Haas. 13. Renaissance facultative logic and the workings of the mind: the ‘cognitive turn’ Marco Sgarbi. 16. Kant on the Mind Andrew Brook. 12. Future Directions for Philosophy of Mind Susan Schneider and Pete Mandik.